CARPE DIEM: The Public Choice Lesson of Margarine. "I Can't Believe It Wasn't Legal to Sell Yellow Margarine"
The Public Choice Lesson of Margarine. "I Can't Believe It Wasn't Legal to Sell Yellow Margarine"
"Margarine can indicate any of a wide range of butter substitutes. 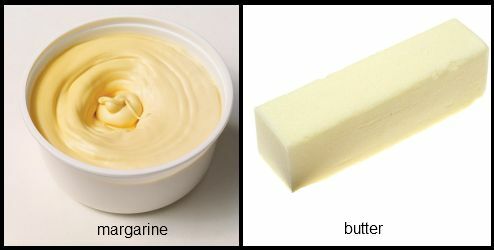 Margarine naturally appears white, or almost white, and by forbidding the addition of artificial coloring agents, legislators in some jurisdictions found that they could protect their dairy industries by discouraging the consumption of margarine. Bans on adding color became commonplace in the U.S., Australasia and Canada and, in some cases, those bans endured for almost 100 years. It did not become legal to sell colored margarine in Australia, for example, until the 1960s. Canada. Margarine was banned from 1886 until 1948 though this ban was temporarily lifted from 1917 until 1923 due to dairy shortages. Nevertheless, bootleg margarine was produced in the neighboring British colony of Newfoundland from whale, seal and fish oil by the Newfoundland Butter Company (which, in fact, produced only margarine) and was smuggled to Canada where it was widely sold for half the price of butter. The Supreme Court of Canada lifted the margarine ban in 1948 in the Margarine Reference. In 1950, as a result of a court ruling giving provinces the right to regulate the product, rules were implemented in much of Canada regarding margarine's color, requiring it to be bright yellow or orange in some provinces or colorless in others. By the 1980s, most provinces had lifted the restriction, however, in Ontario it was not legal to sell butter-colored margarine until 1995. Quebec, the last Canadian province to regulate margarine coloring, repealed its law requiring margarine to be colorless in July 2008. United States. As early as 1877, the first states had passed laws to restrict the sale and labeling of margarine. By the mid-1880s, the U.S. federal government had introduced a tax of two cents per pound, and manufacturers needed an expensive license to make or sell the product. Individual states began to require the clear labeling of margarine. The color bans, drafted by the butter lobby, began in the dairy states of New York and New Jersey. In several states, legislatures enacted laws to require margarine manufacturers to add pink colorings to make the product look unpalatable, but the Supreme Court struck down New Hampshire's law and overruled these measures in Collins v. New Hampshire, 171 U.S. 30 (1898). By the start of the 20th century, eight out of ten Americans could not buy yellow margarine, and those that could had to pay a hefty tax on it. Bootleg colored margarine became common, and manufacturers began to supply food-coloring capsules so that the consumer could knead the yellow color into margarine before serving it. Nevertheless, the regulations and taxes had a significant effect: the 1902 restrictions on margarine color, for example, cut annual U.S. consumption from 120 million to 48 million pounds (60,000 to 24,000 tons). However, by the end of the 1910s, it had become more popular than ever. The long-running rent-seeking battle between the margarine and dairy lobbies continued: In the U.S., the Great Depression brought a renewed wave of pro-dairy legislation; the Second World War, a swing back to margarine. Post-war, the margarine lobby gained power and, little by little, the main margarine restrictions were lifted, the most recent states to do so being Minnesota in 1963 and Wisconsin in 1967. Some unenforced laws remain on the books." MP: It took almost 100 years for common sense and economic logic to prevail in the battle between the dairy industry and margarine producers, and that was a fight between two well-organized, well-funded, politically powerful domestic producers. It will probably take a lot longer, if ever, for common sense and economic logic to prevail in the case of protectionist trade policy for foreign imports. Reason? The two main groups who are adversely affected by protectionism: a) domestic consumers and b) foreign producers, are generally not well-organized or well-funded (domestic consumers) and not politically connected (foreign producers). Actually, healthwise it turns out that margerine is worse for us than butter. But of course nobody knew that back then. For years heart patients were counseled to eat margerine instead of butter. Now we know that margerine is full of trans-fat, bad fat. I ate margerine for years thinking it was the right thing to do for my health. Off topic, I know. This reminds me of the toy scare regarding toys made under contract in China that were contaminated with lead. The public outcry generated by media coverage led to toy safety regulations that put small domestic toy manufacturers at a significant disadvantage to their larger competitors even though it was the larger toy companies that were involved in the importation of the contaminated toys. To add insult to injury, the large toy companies used their political clout to get waivers so that would not have to comply with the very regulations that their lack of oversight brought on. These types of situations are why it always pays to be skeptical of government regulation. Do we know that for sure, or is that just the butter lobby talking? The most mollycoddled, knock-kneed, inbred, enfeebled, subsidized and regulated sector of the American economy is our agricultural sector. As we used to say in the S&L industry: "What do I believe in? Free enterprise and Regulation Q." The USDA should be sunsetted, along with all state Ag departments. Next, let's sunset Labor, Education and cut Defense by 75 percent. We have agencies living long after their usefulness disappeared. There was a time when you couldn't get reading glasses over-he-counter. You needed to see an optometrist for a prescription as glasses might "hurt your eyes". I think that is why you can't find jam in the United States. Here in Norway the heavily subsidized (and therefore overproducing) dairy-farmers, recently got the government to ban calling cheese made with vegetable oil for er... cheese. The producers of these "cheese analogues" have to call it 'toppings' or some such. It's ridiculous. Obama is now banning adding yellow dye to margarine. This is just another of Obama socialism !!!!! We don't want ObamaButter !!!!! I can remember my mother and grandmother mixing in color to margarine. This would be in the late 1940s in Mass. This brings back memories. One of my jobs as a kid was popping the dye container on the plastic bag of margerine and then kneading it until the dye got worked through and it turned yellow. I'm pretty small, but I've always had strong hands; maybe growing up in dairy country (upstate NY) did me that favor. I grew up in a family of margarine smugglers in Wisconsin (1950s). We made regular runs to Illinois to buy margarine that we sold out of the trunk of the car to our neighbors. "The most mollycoddled, knock-kneed, inbred, enfeebled, subsidized and regulated sector of the American economy is our agricultural sector." Wrong as usual, Benji boy. That prize goes to the public sector union parasites your boyfriend champions. I can remember my mom telling stories about this. You could not buy yellow margaraine, but you could buy yellow tablets or powder to color it with. It was my late mother-in-laws job, as a kid hanging out around their corner grocery store in the 1930s, to knead the food coloring into the margarine so that customers wouldn't have to. Well, there's a lot of silly regulations, no doubt. But the issue with coloration of margarine was more of a trade dress issue than anything else. When first marketed, margarine wasn't always sold as "just like butter", it was sold as butter... the coloration ban was an attempt to prevent this bit of deception. You know, I think you could market "clear" margarine now. The manufacturers could sell some clear margarine and say it is a "feature", allowing the customer (you) to dye it for holidays, special occasions, icings, etc. Even after it was legal to color margarine in Minnesota, for years it was illegal to mention butter in a margarine TV commercial. They couldn't do anything about broadcasts from the network, but as late as the early 1970s, I remember the word butter being bleeped out of the Chiffon commercials originating from Minnesota stations.